Jeff R. from Harrisonburg, VA signed. Olga M. from Miami, FL signed. Cory W. from Fort Worth, TX signed. Jeff A. from Fort Myers, FL signed. Faruk R. from Denver, CO signed. It is about time we all laid our fair share! 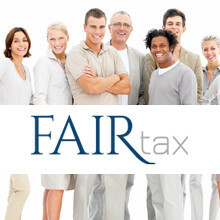 Pass the Fairtax! Jill C. from Antioch, IL signed. Deryl R. from Iowa Park, TX signed. There is little difference between slavery and tax slavery. How about doing what WE want for a change ! This is the only reform that makes sense. It is the only plan that taxes everybody fairly. This plan is the only one that will make April 15th just another day. It's about time you got off your elitist*****and served the peopple instead of yourself for awhile. Please excuse my frustration but from where I'm sitting you guys say one thing then when elected it's forget about the everyday citizen because I don't have to abide by the rules that they do or worry about social security, healthcare, or a retirement why because these dumb bastards are going to supply it for me anyway. I have really lost faith in my representatives fromKentucky and their fellow republicans for not supporting the president as much as they did the last administration. You have the opportunity to change my mind and this is it or my vote will not go to either Mitch, Rand or Andy. Your responses in the past on this matter in particular have been vague and evasive at best with nothing better to offer. It's time fellas to put up or shut up and I know you have nothing to put up. Thank you for allowing me the time to share my displease with how you are leading it surely isn't what I expected from a tenured group of men. Our current system is corrupt and ineffective. Someone from Concord, NC signed. Someone from Jackson, GA signed. Cameron L. from Jackson, GA signed.